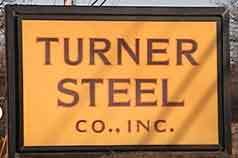 "Turn to Turner for Steel"
To make an inquiry or an order please contact one of our inside sales people. Our business hours are Monday thru Friday 7am to 5pm. Our minimum order is $25 for pickup, or $150 for delivery. We deliver to Massachusetts, Rhode Island, Southern New Hampshire, and Eastern Connecticut areas. Only certain areas of each state are covered. Please call to inquire. NEW -- WE NOW OFFER WEB ACCESS TO OUR CUSTOMERS!!! We can now provide you with 24/7 web access to your information. View your open orders and view or print invoices and MTRS. Contact Glenn W. Turner for more info and to setup your username and passsword. "Our Strength is Our Service"